Kids manipulate their parents. It’s part of their normal routine. They learn to use their charms and strengths to get their way and negotiate more power in the family. On the one hand, some forms of manipulation by kids are harmless. For example, if your daughter wants to go to a dance on a Saturday night, and she’s extra charming to you that week, but at the same time she’s getting good grades, she’s trustworthy, and she’s doing her chores, then she should be able to go. The display of charm is sweet, appropriate, and harmless. On the other hand, that charm can be used inappropriately, such as when a child plays one parent against another to get what he wants. Or when a child has demonstrated previously untrustworthy behavior and tries to manipulate his parents by being overly sweet and compliant in order to get the chance to go out on Friday night. “My son can be the sweetest, most awesome kid in the world,” says Tracy of her 10-year-old son Jarrett. Tracy recalls the night Jarrett’s meltdowns went over the top. The real problem with manipulation is when kids use behavioral threats to manipulate you, as in the case of Tracy and her son. 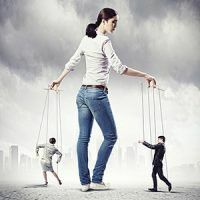 In this type of manipulation, the child is telling you, “Give me my way or face my crap.” In other words, “If I don’t get my way, I’m going to make trouble for you.” In this situation, the manipulation becomes a power and control game for the child, and that’s where it gets dangerous for parents. When kids wrestle with their parents for power and control over things, the child does things that are inappropriate, and the parents do things that are ineffective. The child talks abusively or pitches a fit, which is an inappropriate way to get what he wants, and the parents back down or give in, which is an ineffective response. A good example of how this power struggle plays out in the home is when a child starts talking about going out in the evening and you tell him, “No, your homework’s not done, so you can’t go out until it’s done,” and the child’s voice gets louder as he resists, and his tone gets harsher. You may look at it as anger, frustration or an inability to handle stress on the part of the child. But it’s really a sign that the child is trying to manipulate the situation—and you—through power. In his mind, being harsher and louder will tip the balance in his direction. The child is making a power thrust—an attempt to use some form of behavior or verbally abusive power to get his way. It’s like an emotional sword in his hand and he thrusts it at you. If a kid grumbles and gets a little mouthy on the way to his room or on the way to do a chore, that’s not a power thrust. I’m talking about intimidating, threatening behavior. This is manipulation that is designed to make you back down. These are good questions to defuse the situation. Number one, it gives the kid direct feedback that he’s bullying you and being inappropriate. It reveals to him what you’re experiencing. Number two, it takes some of the power out of the power thrust—it brings it down to its right size. Identifying it tends to neutralize it to some degree. But remember, if your tone is hostile, it’s going to sound like a challenge to the child, and we don’t want to do that. We simply want to question it. So just calmly ask him if he is trying to bully you. If he says he’s not trying to bully you, then tell him to please lower his voice. What you’re doing here is giving the child a decision tree that re-focuses the conversation on the new problem, the real problem, that problem that he is manipulating you to gain power and control. The conversation is no longer about going to the dance—the conversation is now about his attempt to intimidate you and that intimidation will not get him what he wants. Another form of manipulation kids use is to split their parents. They’ll go to the parent who they think is the weakest link or the one who has wavered in the past in order to gain power. That’s why parents have to be very coordinated in what they value and what their decisions are. If both parents agree that homework has to be done for the entire week before the kid’s weekend starts, and if the teacher says that the child’s assignments aren’t done from Tuesday, on Friday night the child can’t start watching TV or play video games or go out until that homework’s done. As parents, you both have to decide what the plan is and follow it through. There can be no excuses, whether the child is being overly sweet to get out of doing homework or whether he throws a tantrum to get out of it. Both tactics are manipulative and they should be dealt with in the same way. Don’t set up a situation where dad or mom gives in and lets the child off the hook if they cry, whine, plead, resist, act out, or simply lay on the charm. Stick to the plan. Kids watch their parents for a living. It’s their job. It’s what they do. And they know their parents have more power than they do. So they learn quickly which parent can be manipulated and how much it will take to get that parent to give in. Some parents will give in when the child applies a little more charm and warmth. Other parents give in when the child lashes out, screams and gets abusive. You can be sure your child knows what it takes to make you back down. So you need to be sure to talk about your plan for managing this behavior as parents and stay on the same page. Never say, “I’ll talk to Dad about it,” if you don’t agree with something Dad has decided. Don’t ever do that. It’s the child’s responsibility to work it out with the parents in an appropriate way. When parents disagree, they have to handle it privately. If the consequences change, they should be changed by the parent who delegated them, so that the parents remain empowered. He was still yelling at us. I said I’d come in and check on him in twenty minutes. So we all went out to the front porch. He started acting out even louder while we were out there. Any other time, I would have freaked out at that moment. He screamed and slammed things in his room. Normally, that’s when I would typically be like, ‘Okay, just calm down,’ and kind of give him his way. But this time, because of the way everything was explained in The Total Transformation program, I had a lot of confidence in what I was doing. I totally ignored his behavior. We sat out there, reading the workbook and just discussing how we wanted to handle it. Gradually, I heard less and less out of him. After about twenty minutes, I came back inside, and I just about fell over because his room was totally put back. He was in his bed with his blanket over him and his light off.